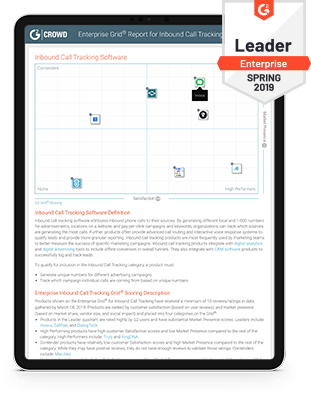 Call tracking customers have spoken and they have made Invoca the top-scoring leader in the G2 Crowd Spring 2019 Enterprise Grid® Report for Inbound Call Tracking Software. No call tracking platform had a higher overall score. Our customers are happy to tell you why Invoca is the leader—an overwhelming 94% of G2 Crowd reviewers rate Invoca at 4 or 5 stars and nearly 90% would recommend the platform to others. Want to learn more? Get the report now or call us at 844-897-1993. Copyright © 2019 Invoca. All rights reserved.